Last night John Lewis was leaving his office when protesters shouted racial slurs at him. Lewis is an African-American. The word hurled at him in insult was the N-word. I cannot remember who taught me that using that using that word was not acceptable. However, I do not ever remember thinking of it as helpful or useful word. Neither do I remember thinking of it as word that expresses kindness or consideration. No, in my memory it has always been a hateful and hate-filled word, a “bad” word if you will. I was glad to read today that House Minority Leader John Boehner and Republican National Committee Chairman Michael Steele both condemned the use of such words. Their condemnation of such words in no way means that they are in agreement with John Lewis’ politics. It does signify that they recognize that there is a certain minimum level of civility necessary to carry on productive political discourse. At this late date in history, America should have a more intelligent vocabulary. We ought to be able to express disagreement, even strong disagreement, with words that express respect and due consideration until we find words that bring us to mutual understanding and cooperation. Disagreeing and protesting are every Americans prerogative. Doing so in a way that is honorable and thoughtful reflects not only our appreciation for our country, but also on the kind of values that our parents passed onto us. 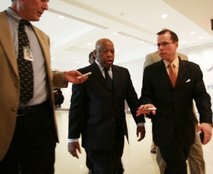 To those who met Congressman Lewis as he left his office yesterday with racial slurs, protest away. Disagree from daylight to dark, but be nice about it, otherwise you look like the latest incarnation of the Ku Klux Klan rather than a legitimate movement that has a message that needs to be heard. This entry was posted in Justice and tagged John Lewis, ku klux klan, N-Word, Racial ephitet, Racial slur by edsundaywinters. Bookmark the permalink. But some Republicans defended the people who used the terms–even Boehner. Further, it wasn’t just Lewis but many in the Congressional Black Caucus. And Rep. Barney Frank (D-MA), the only “out” gay man in Congress, was called “fa&&ot.” That’s just as bad. You are right Mike, but I was just glad that some in leadership position had the decency to try to distance themselves from such remarks. Such language is bad and there is no excuse for it. Click over to my blog; Got a great link there, tinyurl of conversation between Ed Kilgore and Sarah Posner of religiondispatches.org I want you to listen to on these matters.